Quick 4 mile run this morning. (After being out of town for a week there is a LOT of catch up work to do!!) I have my iPod set to play songs in random order. Today the random mix was a lot of fun! It was the kind of music that would make people naturally want to dance when they hear it. On today’s run, I chose to consider a thought that I heard yesterday on an audio book while driving. It was in reference to Pope John Paul II’s historic visit to communist Poland in June of 1983. He said to the ½ million people who came to listen, “You are not who ‘They’ say you are.” When I hear or read things that strike me, I like to personalize them. So I changed a few words to “I’m not who ‘They’ say I am.” After thinking about it a little more, I decided to turn the statement in a more positive direction. “I am who ‘I’ say I am.” It implies that I have a choice about who I am. I am a runner, because I stay that I am. I am a musician because I say that I am. I am a Father because I say that I am . . . . I choose what / who to be. As I continued to run, it occurred to me that this concept coincides with ideas from a book that I am re-reading by Seth Godin called “Tribes.” Together, I am learning that to reach my ultimate goals, I have to become something different than what I have been. Or, at least, change how I have seen myself in the past. I cannot follow someone to my objectives. I am not a follower. To reach the pinnacle, I have to lead the way, even if it is just for me. (But I hope others will come along.) I am a leader because I say that I am. In some ways, this is a hard transition for me. It is not comfortable. Mainly because I have never looked at myself this way. But these ideas do not consider nor give any weight to the past. That is by design, perhaps. Thankfully, that is part of the power of it. The A2B Journey budged another 4 miles eastward. 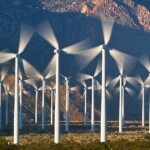 The most significant find was the Wind Farm at Cabazon on the south side of I-10. With 53 turbines turning, it is an impressive sight. The farm generates enough electricity to power approximately 12,000 homes. 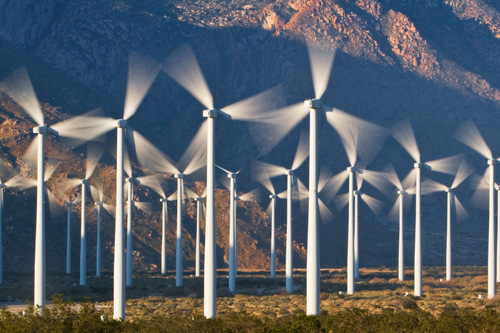 You’re right — the wind farm is awesome to see. It is mesmerizing and incredible to behold. Go green power! I like seeing the wind farms. I wish there were more of them around. Nice clean, easy source of power.